The 9 Commandments? 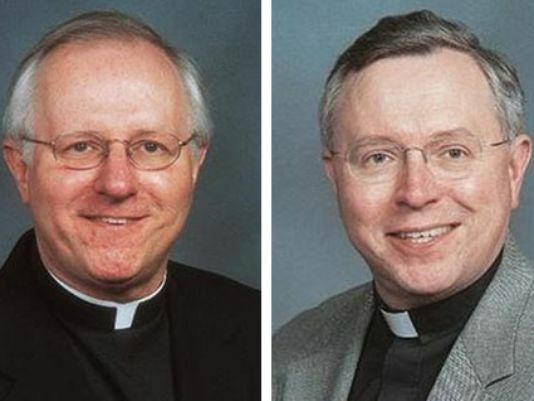 Priests at Two Churches Are Accused of Theft…and They’re Brothers! What do you call your brother if he’s a priest? Father? I suppose that mystery was amplified in the Belczak family. Many years ago, Michigan brothers Edward Belczak (below, left) and Thomas Belczak decided that they loved the Catholic Church so much, they wanted to become its professional holy message-spreaders. After a while, they figured that they were entitled to quite a bit more than what the Lord, in His wisdom, had been giving them — and they took it. These charges come just months after Belczak’s brother, Father Edward Belczak and his church administrator were indicted for stealing about $700,000 from St. Thomas More Church in Troy over eight years. It’s unclear to law enforcement officials if the investigation of Thomas Belczak is connected to the investigations of his brother in Troy. … allegedly included most of a $350,000 gift to the church from the family of a dead parishioner and cash donated by churchgoers during special Mother’s Day and Father’s Day collections, prosecutors said. The priest spent some of the money on a condominium in Palm Beach, Fla., according to the indictment. I’m sure it’s all a giant misunderstanding… or perhaps the godly brothers have a version of the Ten Commandments that somehow excludes the one about stealing.